When the votes were finally counted for Governor, Republican Mike Pence's share of the popular vote had fallen below 50%. Governor-elect Pence ended up with 49.6% of the vote, while Democrat John Gregg had 46.4% and Libertarian Rupert Boneham ended up with 4% of the vote. Gregg may well have pulled out a victory had he gotten out of Sandborn earlier. The hokey commercials made in his hometown didn't seem to work and offended some urban, professional Democrats who saw the commercials as portraying Hoosiers as a bunch of hicks. When Gregg started running more polished and more serious commercials he seemed to do better. Pence meanwhile might have sat on his lead a little too long, running out the clock. But in politics, a win is a win. It doesn't matter that it was close. Pence has a unique opportunity to build a legacy that will not only put his stamp on the state but will position him for a much easier re-election in 2016. Pence needs to immediately take steps to reach out to those people who did not vote for him in 2012. He needs be willing to bring in people who did not support him to, not only to converse with those folks on issues but make them feel like the doors of a Pence administration will be open to them Pence would be wise to read "A Team of Rivals" by Doris Kearns Goodwin, a book that showed how Lincoln, in victory, sought to bring the country together by the reaching out to opponents, even going so far as to making them part of his administration. Pence supporters may scream foul, that the Governor-elect might have his goals usurped by people of a contrary message. I don't buy it. 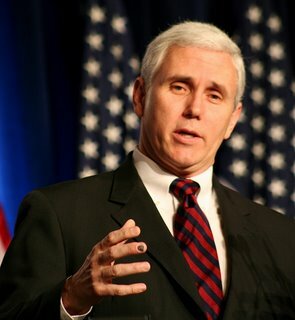 While he is a very personable individual, Pence also has very strong, well-developed views. He is not going to be suddenly swayed to change positions by reaching out to opponents and working with them on areas where they have common ground. Make no mistake about it, there is a lot of common ground, issues on which Pence and those who failed to support him can work together. Pence would be wise to start reaching out to his opponent to find those issues, wise to start building bridges instead of burning them. If Governor-elect Mike Pence does that, I have no doubt he will be a very popular governor well-situated to win re-election in 2016. I agree that the Sandborn tv spots were horrible and made Gregg look more like a country bumpkin than someone who has a vast resevoir of knowledge about our state and how it functions. Working well with the opposition is not the "Daniels Way". Don't expect the Governor-elect to veer off of his predecessor's path. Daniels and Pence have vastly different personalities. I think people are going to find the Governor's Office under Pence much more open to dialogue than people are expecting. Well, that would be a big switch. Paul, sorry I think that you are wrong. Pence wil turn right the day he gets into the office. He did not show his true colors during the election..he just told us what we wanted to hear.